This is a Christmas picture I especially treasure. 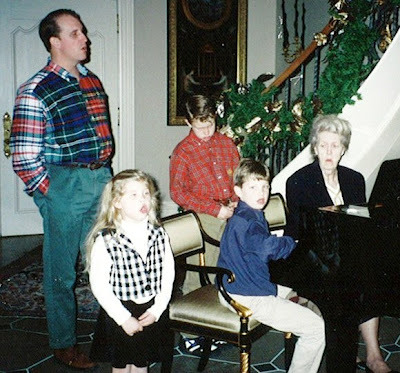 My mother loved to gather her three grandchildren around the piano at Mark and Kim's house and sing Christmas carols. I think this is such a sweet picture of Natalie, who is singing her little heart out. Brock, too is singing along. But John, oh John, he was not at all happy about singing that night. I think early adolescence was rearing its head. This was made in 1994, shortly before his eleventh birthday. 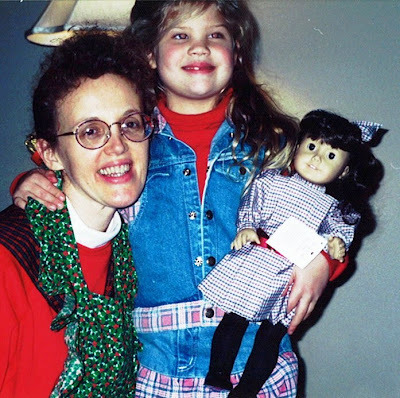 In 1995, we, along with Mother, got Natalie her first American Girl doll, Samantha. I don't know who was more excited, Natalie or me. "Aunt Susan, I have a secret." Lots of secrets before we opened our packages. Oh, the suspense! 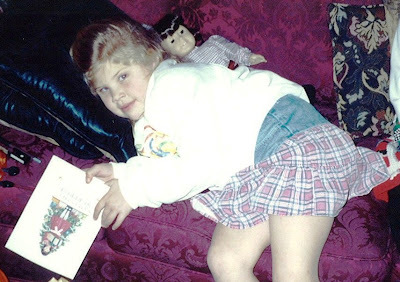 Christmas is truly a wondrous time of year, but it is never more magical than when seen through the eyes of a child. Hey, Brit! Thanks for the comments! That's the best part! You are so sweet!